The SLRG has sold SLRG 201-203 to Independent Locomotive Service (ILSX). I heard this from an employee while I was down there for the 489 special last week, and found that 201 had already been relettered with ILSX on the side. Today (Sunday) in Pueblo, I saw 203 (ex-DRGW 5373) and one other (probably 202) on the Union Pacific side of the yard. My guess is that they'll probably make their way to Denver on MPUNY in the next night or two. I've also heard that the B39-8Es (the ex-LMX 8500s) are on short time, so get your pictures of them sooner rather than later. So, for those interested, one last shot of each of the 200s last week in Alamosa: [SLRG 201], the already-patched [ILSX 202, and [SLRG 203]. After 36 years, D&RGW C-16 #278 is no longer on display over the Cimarron River in western Colorado. Two weeks ago, on May 15-16, the equipment was removed and put into the storage yard near US Hwy 50 as the first step in a long overdue restoration. For those who don't know the history of the area, Cimarron was once an important point on the narrow gauge mainline through the Black Canyon of the Gunnison River and over Cerro Summit. West of where the Morrow Point Dam is today, the canyon was too rugged to build a railroad through, so the Grande opted to exit via a narrow side canyon carved by the Cimarron River. Once out of the Cimarron canyon, the line climbed up and over Cerro Summit to reach Montrose. Just at the canyon exit, the Grande founded the town of Cimarron. Given the grades to the west, the town became the eastern helper station, complete with a double-spouted tank and small enginehouse. 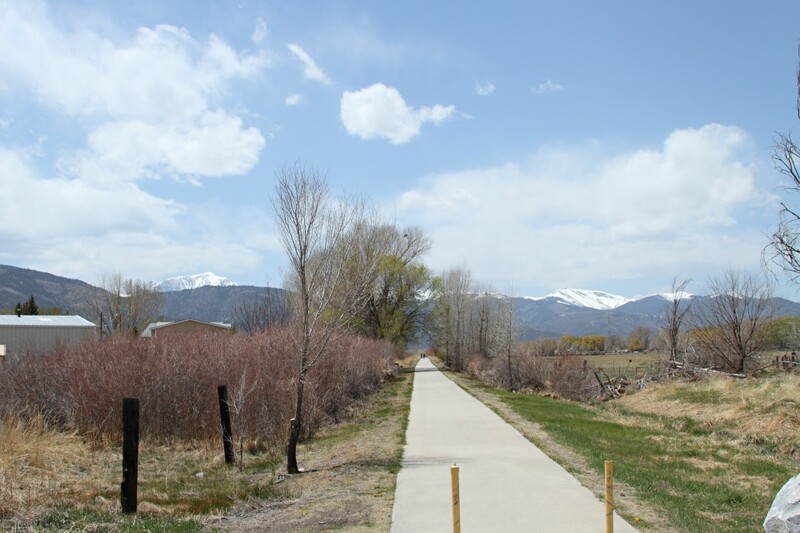 It also served as an important sheep and cattle loading site for western slope ranchers. When exiting the main canyon, they passed over the Cimarron River via a deck truss bridge. Initially made of wood, the structure was replaced with the current wrought iron one in 1891. The bridge, sitting in its original position, is the only accessible structure of the narrow gauge through the Black Canyon - the rest were either removed with abandonment in 1949 or drowned behind the Morrow Point and Blue Mesa dams. 278 worked this part of the system, and upon retirement in 1953 it was donated to the City of Montrose. Two decades later, it was leased to the National Park Service, fixed up, and placed along with boxcar 3132 and caboose 0577 on the Cimarron bridge, located just west of the Morrow Point Dam. [This] is what it looked like when I visited in 1990. In recent years, the equipment has started to show significant deterioration from a lack of attention. On May 15-16, the equipment - 278 and tender, boxcar 3132, and caboose 0577 - was pulled off the bridge, loaded on lowboys, and hauled up the road a mile to a storage yard. The NPS intends to do a multi-year restoration to get them all in top cosmetic condition once again. Once that is complete, there's talk of reconstructing one of the roundhouses to house the equipment and building some amount of track to display it during the summer. There's very little chance it will go back on the bridge. For those interested, the NPS has a very thorough document on their plans that I've mirrored [here]. They also have a [map of the Cimarron townsite] comparing 1919 with today. Last Tuesday, 489 made its first appearance over the road with a green boiler jacket in over 60 years. Back on 21-May-1950, the Salida shop guys painted 489 with a green boiler jacket for a Rocky Mountain Railroad Club charter to Monarch and Villa Grove. Last week, thanks to the tireless efforts of Russ Sperry and Alan Loomis in organizing and another half dozen individuals who volunteered to do the scraping and painting, we had the chance to once again see 489 painted that way. The trip left Antonito around 1250h, with a goal of being into Osier by 1815h and back in Antonito around 2200h. Everything went smoothly, except for the fact it wasn't dark enough and there wasn't time to squeeze in any night shooking. It was, without a doubt, one of the best charter runs I've been on in a while - good weather, good people, and a whole lot of fun. 489 IN GREEN - IT'S HERE! Two weekends ago - May 15-17, 2010 - a group of volunteers got together to get 489 ready for her season in green. Russ Sperry (lead greenie and mastermind of this whole effort), Steve Forney, Nathan Zachman, Jan and Jeff Ellingson, and Jim Poston got together to scrape down 489 on Sunday, and then repaint her to green on Monday. 489 was originally painted with a green jacket by the Salida shop forces for a Rocky Mountain Railroad Club charter 60 years ago, on 21-May-1950. Thanks to Russ' tireless efforts, along with others behind the scenes, we get a chance to recreate this event tomorrow (though on a different stretch of track). The first big rockslide to befall the Grande in the last couple weeks was somewhere within Gore Canyon. Certainly not an odd place to find large rocks, but the first of things to come. Then on Saturday, 15-May-2010, the westbound Amtrak California Zephyr (#5) encountered a rockslide between Plain and Crescent. Tipped off by an activated slide fence, the crew safely stopped short of the slide, but it still forced #5 to back all the way to Denver. Reports are that the slide was very near milepost 29.5, which would put it near Tunnel 17. Amtrak 5 was then backed to Plain, where they moved P42 #67 to the rear and started making the long reverse move to Denver. 5 then became 6, the eastbound Zephyr back to Chicago, and 6 was made into 5 at Fraser, CO. Buses moved passengers over the gap between. "Rovertrain" on Trainorders.com posted a few pictures of the slide in [this thread], or for those of you who aren't members, [here's the most telling shot]. Kevin Morgan also has a number of pictures of the reverse move posted [here]. Then, not two days later, a semi carrying a large piece of excavating equipment hit the Colorado 72 overpass at around 1330h on Sunday, 17-May-2010. Unlike previous strikes, this one apparently did significant structural damage. Reports on the D&RGW list are that 72 was all but closed (local traffic only) and that there are temporary steel supports in the eastbound lane holding up the bridge. UP has been opening nightly work windows to perform emergency work on the bridge, allowing trains over the top during daylight hours. 9News.com has an early article about it [here], and I'd like to thank members of the D&RGW list for providing additional updates and details. CDOT is currently saying that 72 is open to traffic both directions as of this afternoon, so UP must be done with whatever repairs they intend to do for now. I'm a bit behind in posting this, but the C&TS 40th Anniversary Events have been announced for the weekend of August 27-31. The highlight of the events will be one of the operable K-36s painted as 483 and in the original gaudy brown-red-black-gold movie colors. For those who don't know, the Grande allowed 483 to be painted in a hideous scheme during the filming of "The Good Guys and The Bad Guys". 483 the arrived on the C&TS property 1-Sep-1970, and powered the first C&TS train into Chama on 6-Sep-1970. It continued operating in that dreadful paint for some time. A few photos of 483 by Ernie Robart on that first move can be found on NGDF [here] and [here]. It's ugly, but it is historic. On Friday afternoon, RGS Goose 5 and a K-36 painted as 483 - the C&TS's first engine - will go from Chama to Cumbres for dinner and a night shoot, and then return to Chama shortly after 2200h. Saturday will bring a 483 photo work train that will drop off cars on a one-way trip from Chama to Antonito. Sunday will be the reverse - one-way westbound picking up cars, reminiscent of that first train into Chama. The price is $350 for both days, or $190 for a single day. Goose 5 will also be following behind the work train both days, and seats there are available for $85. Another special train - a family-oriented, western-themed train called the Rocky Mountain Express - will run round-trip from Chama to Cumbres on Saturday as well. Departure from Chama is 1100h. Monday, 30-Aug-2010 will bring a special commemorative 483 freight from Chama to Cumbres and back, designed specifically to re-enact the first arrival in Chama. The website currently says ridership is invitation only, though some seats may be made available. Also, the Goose will run from Chama to Antonito, with seats available for $85. Tuesday, 31-Aug-2010, wraps things up with a return Antonito-Chama trip for Goose 5. Tickets are again $85. Full details can be found on the C&TS website [here]. 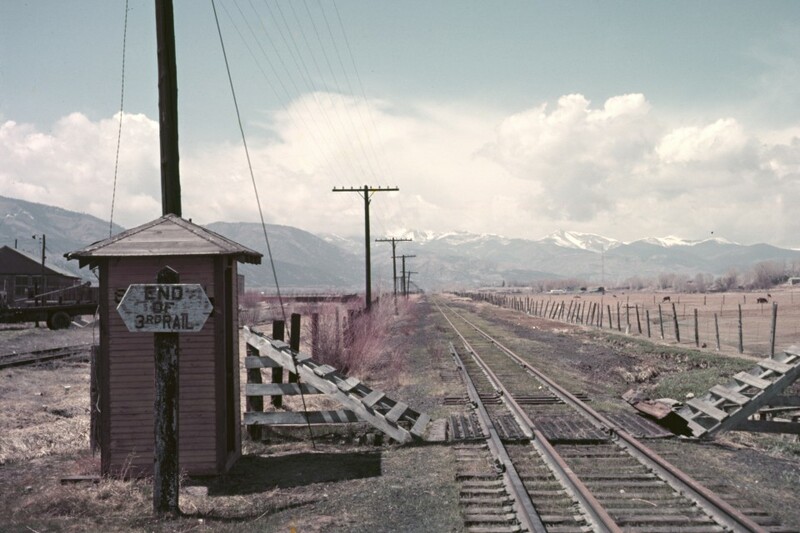 I recently acquired a medium-format color slide of Salida's "End of Third Rail" sign, located just west of the 7th Street crossing, that was taken in April of 1954 (original photographer unknown). Ever since, I've been itching to pull a "John Fielder" and recreate the scene today. Well, a quick drive today turned into a lap around Salida and back, so I stopped to capture the same view today, a hair over 56 years later. My angle is a bit off, but considering I hadn't planned to do this and I could only view the original on my cell phone, I think I got some pretty decent results. The Salt Lake Tribune announced yesterday that America West Resources Inc., owners of the Horizon Mine northwest of Price, UT, has signed two large coal contracts. The article can be found [here]. The largest contract is to sell $200M worth of coal over the course of four years to a China-based energy group, which will provide the coal for power generation and other thermal use to various Asian markets. The other contract is an 8 month, $7.4M contract with a utility on the West Coast. The mine does not have its own loadout, but rather will truck coal to either the Wildcat (closer) or Skyline loadout for train loading.